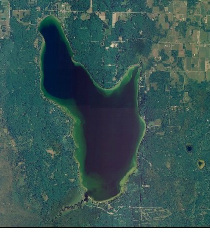 Scenic Hubbard Lake is Michigan's second largest inland lake and named after famed geologist Dr. Bela Hubbard who first surveyed the area in 1850. It was even once named one of the 10 most beautiful lakes in America by National Geographic. 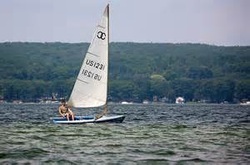 Today, Hubbard Lake is a prime recreation area with water sports and golf a main attraction. The lake is roughly 7 miles by 3 miles in diameter with its deepest point at around 85 feet. 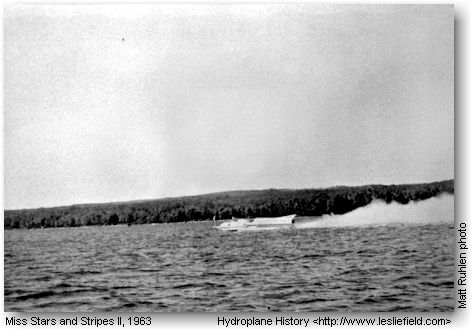 In an early claim to fame, race boat driver Les Staudacher was severely injured when he drove the Miss Stars and Stripes II across Hubbard Lake at a record breaking pace of 280 mph. After reaching record speeds the Stars and Stripes had its runner assembly come loose, and the boat veered off onto the wooded shore. Before impact Staudacher was able to roll out of the boat and was found by his crew 100' off shore. He was unconscious and had broken virtually every bone in his body. Tucked quietly away in the northeastern portion of the Lower Peninsula, Hubbard Lake sits quietly just north of the more popular East Tawas and Oscoda shorelines. Michigan's twelfth largest lake, Hubbard spans nearly 9,000 acres and is nearly 90 feet deep with springs filtering the water continuously. Hubbard Lake provides boundless opportunity for just about any water activity - boating, fishing, water skiing, swimming, kayaking (especially in the morning) and canoeing. With three streams feeding the lake, Comstock (West Branch River) at the south end, Sucker on the east side and Holcomb off of East Bay, the opportunity for wildlife viewing is endless, and don't be surprised if an occasional eagle soars overhead..
Anglers enjoy fishing on Hubbard Lake because they can catch smallmouth bass, walleye, northern pike, yellow perch, rock bass pumpkinseed and bullheads, suckers and gar. The Hubbard Lake Sportsman and Improvement Association spends a lot of time and effort ensuring that the fishing on Hubbard Lake continues to thrive by building and placing brush shelters in the lake to provide cover for walleye and other fish. Hubbard Lake is well known for its walleye, smallmouth bass, northern pike, yellow perch, rock bass and pumpkinseed. Anglers come from all over the state to fish the crisp clean waters. Mornings and evenings on Hubbard Lake offer scenic sunrises. Tranquil moments and calm waters offer the perfect waters for kayaking and canoeing. But don't let the quiet fool you...storms have been known to pop up out of nowhere and sweep across the lake quickly. There is plenty of lake to find your perfect quiet spot. Playing on the water is a popular recreation pastime as well. 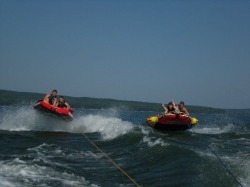 Whether tubing, water skiing or just chiilin on the Pontoon. Hubbard Lake is one of northern Michigan's hidden gems. 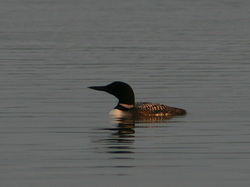 Many family's have been coming to the lake for generations. Eagle Ridge Golf Course which is set in the heart of the Huron National Forest in Northeast Michigan. Eagle Ridge features a challenging 18 hole golf course, a full service restaurant with lounge, and a premium 220 seat banquet and catering facility. White Pine National Golf Course - Their world class conditions will bring out the absolute best in your golf game. You'll find that White Pine National is fair to the high handicappers and challenging to the low handicappers. Thunder Bay Winery's and their elegant tasting room is located in the historic Center Building in Downtown Alpena. The knowledgeable staff will guide you through a tasting which includes four complimentary samples or try the entire sheet for $5. Stay for a glass of wine and order lunch or dinner in from The Fresh Palate Gourmet. 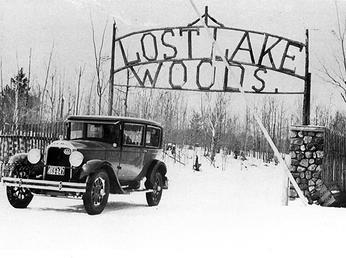 Lost Lake Woods - MICHIGAN'S BEST KEPT SECRET!